Designed for large scale, big-area lighting, the 4,000W HMI Lunar light can be provided on a generator trailer, or suspended from ceilings or machinery. An ideal solution for internal lighting where the light can be suspended, the 4,000W HMI lights from Lunar Lighting are used across a broad range of applications, especially in warehousing, maintenance shutdowns and exhibitions. The 4,000W HMI Lunar light delivers excellent lighting performance with an output of 400,000 Lumens from a single unit compared to approx. 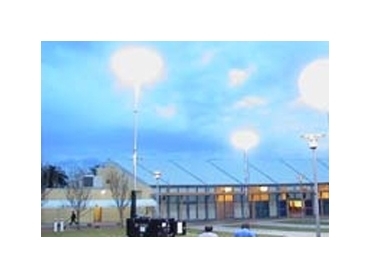 100,000 lumens from conventional lighting towers. The light provides a natural daylight-colour temperature, and provides a safer work environment with no towers or support to get in the way. It can also be mounted on a Lunar power-plant for maximum versatility. The 4,000W HMI Lunar light is significantly over-engineered for the job, similar to the entire Lunar range. The Honda GX620 functions at approximately 60% of engine capacity on full load. The system produces sufficient ancillary power on full load for other lights in the Lunar range to be connected. The 4000W HMI Lunar light is capable of exceptional lighting power in a glare-free 360º or 180º focused or diffused configuration. The lighting tower is transported on a light, easily manoeuvred trailer. The telescopic mast rises 10m, and the power unit has four hydraulic stabiliser legs for setting up on uneven terrain. The light head fits into places that lighting towers cannot access because of their size.